Japan-US-India trilateral security cooperation has been progressing fast. These three countries hold foreign minister level strategic meetings and trilateral naval exercises called Malabar. The increasing US-India arms trade especially indicates how much progress has been achieved (Figure1). Arms are to be used in tough conditions while retaining their mechanical precision. As a result, they need maintenance, and the importing country depends on the exporting country for supplying spare parts. India’s increasing import of arms from the United States means that India has started to trust the United States as an arms supplier. By the same logic, India’s plan to import the US-2 amphibious plane from Japan is symbolic of developing Japan-India security cooperation. Such progress substantiates that Japan-US-India trilateral cooperation has been advancing to a level that could not be expected during the Cold War. Source: This figure draws on the database of the Stockholm International Peace Research Institute (http://www.sipri.org/databases). About 91 percent of India’s cumulative total arms import has been from these five countries. Why has Japan-US-India security cooperation progressed rapidly? Can such trilateral ties be regarded as cooperation among “natural allies,” a term President Barack Obama emphasized in India in 2010? This positive scenario engages three questions that emerge in this context: 1) what background factors propel this relationship forward? 2) how should we interpret these factors and their durability? and 3) what are the effective methods by which Japan-US-India cooperation could be further realized? China’s maritime expansion has been based on opportunistic responses to a vacuum or a shift in the military balance. For example, in the South China Sea, China occupied the Paracel Islands in 1974 just after the Vietnam War ended and the US withdrawal from the region. After the Soviet Union withdrew from Vietnam, China in 1988 attacked the Spratly Islands controlled by Vietnam. On similar lines, after United States withdrew from the Philippines, China occupied Mischief Reef, which both the Philippines and Vietnam claimed. For a long time, US-led bilateral alliances—notably with Japan, South Korea, Australia, and the Philippines—have maintained order in the Indo-Pacific. However, deep security ties are lacking among the US allies. For example, both Japan and Australia are US allies, but there have not been close security relations between them. This system would effectively function if the United States had enough military resources to tackle all the problems in this region. However, the situation has been changing gradually, as US military resources have been spread thin to meet rising needs. The “hub and spokes,” bilateral, “old” alliance system is not enough to maintain peace and order in this region. This changing power balance is best reflected in “China’s assertiveness” in the region and points to the need for an alternative system that can function better in changed circumstances. A new system has started to emerge. Multinational security cooperation arrangements have recently been formed, i.e., Japan-US-India, Japan-US-Australia Japan-US-India-Australia-Singapore, and etc. There is a possibility that the network of these minilateral initiatives will culminate in a collective security system in the near future. 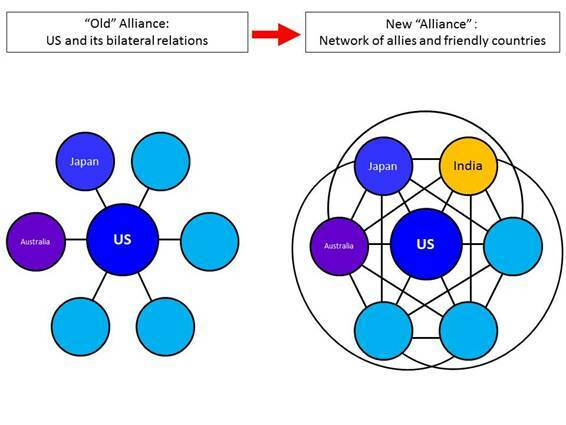 In particular, the first Japan-India-Australia Trilateral Dialogue held in June 2015 was symbolic of this transformation because it did not include the United States. It signaled an effort to share the responsibilities of the United States. In January 2015, the Seventh Fleet commander mentioned that the US navy would welcome Japan patrolling the South China Sea.2 This example shows that the US desire for Japan to share some of its naval responsibilities. Hence, in the near future, it is likely that countries in this region will start new trilateral frameworks—Japan-India-Vietnam,3 Japan-India-Singapore,4 India-Indonesia-Australia,5 and etc. In the worst-case scenario, this security network system will maintain a military balance with China. http://www.isn.ethz.ch/Digital-Library/Publications/Detail/?en&id=193713 (accessed on May 3, 2016). It is crucial that the concerned countries do not ignore the flexibility of this new system. The new security network system is not solely limited to allies and friendly countries, but could be extended to others including China and Russia if the latter acted responsibly under an agreed set of rules (United Nations Convention for the Law of the Sea, a code of conduct with ASEAN, and etc.). The United States invited China to the Rim of the Pacific Exercises in 2014. Through such initiatives, it has tried to persuade China to cooperate with it and its allies. India, Australia, and most Southeast Asian countries have also held joint exercises with China. In anti-piracy measures off the coast of Somalia, not only Japan, the United States, India, and other Asian and European countries, but also China and Russia cooperate with each other. These examples indicate that this cooperative multilateral security framework has good potential not only for maintaining the military balance but also for defusing tension. Not only can one be optimistic that this new security network is an effective system, but there is also good reason to conclude that Japan-US-India cooperation will be the deciding factor. Because India has been facing a similar border conflict with China, its view toward a rising China is likely to be the same as that of Japan and also the United States. Currently, India is recording about 350 to 450 incursions by China in the border area every year. Chinese submarines have been sighted on an average of four times every three months in the Indian Ocean.6 A proactive Japan, the traditional power—the United States—, and a rising India will be the most influential countries in Asia except China. There are two effective methods by which Japan-US-India cooperation could maintain the military balance in Asia. First, in border areas, because of being geographically located at opposite sides of China, Japan and India with US support can rectify their own respective numerical inferiority. For example, if India cooperates with Japan, India will not need to deal with all the Chinese fighters at once because China is likely to keep some of its fighters on its eastern side against Japan and vice versa. Second, if India has the required will and enough capabilities, Japan and the United States will be able to alleviate the heavy burden of safeguarding security in the Indian Ocean and can deploy more military force in the East China Sea and South China Sea to maintain the military balance in Asia. This is the main reason why Japan and the United States are cooperating with India’s naval projects, including the infrastructure projects in the Andaman Nicobar Islands and Lakshadweep islands, shipbuilding capacity building for warships including the Indian aircraft carrier Vishaldevelopment project, and arms exports, such as the P-8 anti-submarine patrol planes. Japan-US-India collaboration should include their policies towards the South China Sea. Both Japan and India have already started to support the armed forces of Southeast Asian countries, e.g., an Indian trained crew of submarine and fighter pilots in Vietnam. Japan and the United States donated patrol ships to Vietnam. In this case, collaboration sends a powerful and effective message to China to restrain its assertiveness. The main background factor driving Japan-US-India security cooperation is the changing US-China military balance. Countries around China, including Japan and India, need to deter China’s assertiveness by maintaining a military balance and persuading China to show more responsible behavior. For this, the emerging new security cooperation network with the United States will be effective. Indeed, Japan-US-India cooperation will be the decisive factor. To maintain the military balance, Japan-US-India cooperation can use a linkage of the East China Sea and the Indo-China border, while sharing the burden in the Indian Ocean and collaborating to support Southeast Asian countries in the South China Sea. In light of these factors, it is logical that Japan, the United States, and India will promote their relations to a higher level. The time has come to proactively further this trilateral cooperation to ensure prosperity and stability in the whole Indo-Pacific region. 1. “China submarines outnumber U S fleet: U S admiral,” Reuters, February 25, 2015, http://www.reuters.com/article/2015/02/25/us-usa-china-submarines-idUSKBN0LT2NE20150225 (accessed on May 9, 2016). 2. Tim Kelly and Nobuhiro Kubo, “U S would welcome Japan air patrols in South China Sea,” Reuters, January 29, 2015, http://www.reuters.com/article/2015/01/29/us-japan-southchinasea-idUSKBN0L20HV20150129 (accessed on May 9, 2016). http://www.dsalert.org/int-experts-opinion/international-geo-politics/594-assessing-the-strategic-importance-of-vietnam-current-security-dynamics-for-japan-and-india (accessed on May 9, 2016). 4. Satoru Nagao and Koh Swee Lean Collin, “A Japan-Singapore-India Maritime Partnership: A strategic partnership could be key to dealing with Indo-Pacific challenges,” The Diplomat, February 2, 2016, http://thediplomat.com/2016/02/a-japan-singapore-india-maritime-partnership/ (accessed on May 9, 2016). 5. Ashok Malik, “ Australia, India, Indonesia: A Trilateral Dialogue on Indian Ocean,”Observer Research Foundation, September 17, 2013, http://www.orfonline.org/research/australia-india-indonesia-a-trilateral-dialogue-on-indian-ocean/ (accessed on May 9, 2016). 6. Sanjeev Miglani and Greg Torode, “Wary of China’s Indian Ocean activities, U S , India discuss anti-submarine warfare,” Reuters, May 2, 2016, http://www.reuters.com/article/us-india-usa-submarines-idUSKCN0XS1NS (accessed on May 9, 2016).